This book will be the springboard for thousands of innovative workshop projects! What can you do with PIC microcontrollers? Practically anything from creating "photovore" robots that hunt light to feed their solar cells to making toasters announces, "Your toast is ready!" These low-cost computers-in-a-chips let electronics designers and hobbyists add intelligence, responsiveness, and functions that mimic big computers to any electronic product or project, including robotics. 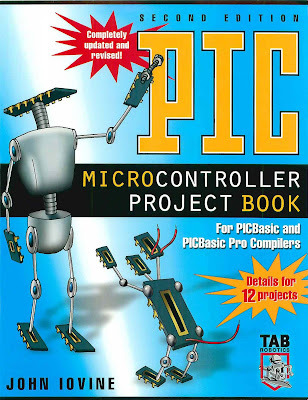 Fully updated for use with the PICBasic Pro as well as the original PICBasic, this new edition of the PIC Microcontroller Project Book gives you hands-on directions for putting Microchip's RISC-based chips to work. Starting with simple projects and experiments, this book leads you gradually into sophisticated programming techniques. You need absolutely no programming experience to get started. John lovine coaches you through every single step. Este libro será el trampolín para miles de proyectos innovadores taller! ¿Qué se puede hacer con microcontroladores PIC? Prácticamente cualquier cosa, desde la creación de "photovore" robots que cazan luz para alimentar a sus células solares a hacer tostadoras anuncia: "El pan está listo!" Estas computadoras de bajo costo en un chip permite a los diseñadores y aficionados a la electrónica agregar inteligencia, capacidad de respuesta, y las funciones que imitan a grandes ordenadores a cualquier producto electrónico o proyecto, incluyendo la robótica. Totalmente actualizado para su uso con el PBP, así como el original PICBasic, esta nueva edición del Proyecto Libro Microcontroladores PIC le da manos-sobre las orientaciones basados en RISC de Microchip chips para trabajar. A partir de simples proyectos y experimentos, este libro te lleva gradualmente a las técnicas de programación más sofisticadas. Usted necesita absolutamente ninguna experiencia en programación para empezar. John lovine lo entrena a través de cada paso. How to Use DOS Instead of Windows. Creating a New i/O Port. Analog to Digital (A/D) Converters. Analog Signal. Stepper Motors. Stepper Motor Construction and Operation. Microcontrollers. What Is a Microcontroller?. Why Use a Microcontroller?. Microcontrollers Are the Future of Electronics. Designer Computers-So Many Microcontrollers. The PIC Chip. BetterThan Any Stamp. Benefit 1: Faster Speed. Benefit 2: Lower Cost. Bonus Advantage. PIC Programming Overview. Software and Hardware. PICBasic and PICBasic Pro Compilers. EPIC Programmer. Serial Port and Universal Serial Bus (USB) EPIC Programmer. Firmware. Consumables. 16F84 PIC Microcontroller. Step 1: Writing Code (The Basic Program). Step 2: Using the Compiler. Step 3: Installing the Firmware, or Programming the PIC Chip. Ready, Steady, Go. Hardware and Software. Installing the Compiler. Installing the PICBasic Compiler Software. Installing PICBaslc Pro Compiler. Installing the EPIC Software. Instailing the EPIC Software in Windows. Installing the EPIC Software from DOS. Applications Directory. ZIF Adapter Sockets. AC Adapter. CodeDesigner. CodeDesigner Features. Software Installation. Setting CodeDesigner Options. First Program. The EPIC Programming Board Software. How to Use DOS Instead of Windows. to Code, Compile, and Program. ComlPile. Programming the PIC Microcontroller Chip. The EPIC Programming Board Software. Using the EPIC DOS Version. Contonuing with the WINK.BAS Program. Testing the PIC Microcontroller. The Solderless Breadboard. Three Schematics, One Circuit. Wink. Troubleshooting the Circuit. PIC Experimenter's Board and LCD. PIC Experimenter's Board. Usage. Bank 3 Is the Same as Bank 2. Simple Experiment. Using the X-Board's LCD: PICBasic and PICBasic Pro Examples. PIC 16F84 MicrocontroUer. Advanced PIC Microcontrollers. Back to the 16F84 Microcontroller. Clock Oscillators. Reset. PIC Harvard Architecture. Register Map. Memory Mapped I/O. Binary Fundamentals. Registers and Ports. Using the TRIS and Port Registers. Writing to a Register Using PICBasic Compiler. Writing to a Register Using PICBasic Pro Compiler. Accessing the Ports for Output. Electrical Binary, TTL, and CMOS. Counting Program. Counting in Binary by One. Variable Space. User Available RAM. Changing Variable Names (PICBasic Compiler). Overwriting RAM Space. Schematic for Program. Counting Binary Progression. Basic High and Low Commands. Programming Review. Comments. Identifiers. Line Labels. Symbols. Variables. Next Chapter-Reading Input Signals. Optional Parts. Reading I/O Lines. Placing Electrical Signals on a Pin. Reading a Port. PICBasic Compiler and Variables BO and B1 (BitO to Bit15). Dynamic Changes. Delay Variable. Basic Input and Output Commands. Basic Input and Output Commands (Pro Version). The Button Command. Debouncing a Switch. Auto-Repeat. Button Example. The Variable Used in the Button Command. Multiple Statements-Single Line. PICBasic Language Reference. Branch. Button. Call. Eeprom. End. For ... Next. Gosub. Gosub Nesting. Goto. High. 12CIN. 12cout. If ... Then. Input. let. Lookdown. lookup. low. Nap. Output. Pause. Peek. Poke. Pot. Pulsin. Pulsout. PWM. Random. Read. Return. Reverse. Serin. Serout. Sleep. Additional Sleep Notes. Sound. Toggle. Write. Additional Command Reference. for IP!CBasDc Pro. Adcin. Asm ... EndAsm. Branchl. Clear. Clearwdt. Count. Data. Debug. Debugin. Disable. Disable Debug. Disable Interrupt. DTMFout. Enable. Enable Debug. Enable Interrput. Freqout. Hserin. Hserout. 12cread. 12cwrite. If ... Then. Lcdin. Lcdout. Lookdown2. Lookup2. On Debug. On Interrupt. Pauseus. Peek. Poke. Pulsin. Pulsout. RCtime. Readcode. Resume. Serin2. Serout2. Shiftin. Shiftout. Swap. While...Wend. Writecode. Xin. Xout. Speech Synthesizer. Speech Chip SP0256. A Little on Linguistics. Interfacing to the SP0256. Mode Select. The Circuit. Program Differences. Program Functions. Peek PortA, bO. Creating a New i/O Port. Serial Communication. Output First. Basic Serial. Clear Pin. First Program. Bit Shift Correcting. Input I/O. Compatibility Issues. liquid Crystal Display (lCD). Serout Command's RS•232 Serial Communication. Error-Detection Algorithms. Parity. Serial Format: Mode and Baud Rate. XTAL Clock, Please. 4.0 MHz Clock Limitations. Three-Wire Connection. Positioning the Cursor. Off-Screen Memory. PIClBasic Pro Project: LCD Module. Using the LCD Module for Display. Reading ResHstive Sensors. RIC Values. Scale. PIN Exceptions. Resistive Sensors. Test Program. Fuzzy Logic and Neural Sensors. Fuzzy lFirst. Fuzzy Logic Light Tracker. DC Motor Control. Diodes. Operation. Fuzzy Output. Neural Sensors (Logic). Multivalue Threshold. Analog to Digital (A/D) Converters. Analog Signal. Digital Equivalents. AID Converters. Setting the Reference Voltage(s). Voltage Range and Resolution. Interpreting the Results. Serial AID Converter Chip Control. TLC549 Serial Sequence. Toxic Gas Sensor. DC Motor Control. The Transistor. First Method. Bidirectional. Diodes. Stepper Motors. Stepper Motor Construction and Operation. Resolution. Half-Step. Other Types of Stepper Motors. Real World. First Stepper Circuit. Electrical Equivalent of a Stepper Motor. Test Circuit Program. One Rotation. Second Basic Program. Half-Stepping. The "ti" Delay Variable. Troubleshooting. UCN 5804 Dedicated Stepper Motor ICs. Servomotors. Extending Servo Motor Range. Manual Servo Control. Multiple Servomotors. Timing and Servomotors. PICBasic Pro Compiler Project: Five-Servomotor Controller. Controlling AC Appliances. Inductive and Resistive Loads. Circuit Construction. Test Circuit. Smart Control. Electronic Nose. A Few More Projects. Binary Clock. Setting the Clock. Digital Geiger Counter. Frequency Generator. In Closing. Suppliers Index. Hexadecimal Numbers. Tremenda labor de recopilación es la que desarrollan los colaboadores de este blog, gracias por el esfuerzo desinteresado. Para mi que prefiero los libros impresos esta es la mejor forma de saber si algún libro en particular vale la pena de ser adquirido, y mejor aún, comparar entre títulos similares para hacer la mejor elección antes de hacer la compra. Gracias. También prefiero los libros de papel.